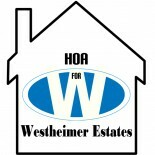 HOA | Homeowners Association for Westheimer Estates, Inc. Homeowners Association for Westheimer Estates, Inc. Happy New Year Westheimer Estates! October 27, 2012	· Enter your password to view comments. Geeks and Company Your Complete Web Presence Solution. Geeks and Company Hosting Get your business on the web Today and Expand its reach to a World Wide market. Geeks and Company Resellers Let Geeks and Company put you in the red-hot domain name registration and Internet business. Enter your email address to follow Westheimer Estates HOA and receive notifications of new posts by email.